The conditional probability is usually lower than the unconditional probability for the same sample size, meaning that the conditional form is generally conservative. The overall probability of achieving the desired precision and capturing the true mean is easily computed as the product of the half-width probability and the confidence level. In this case, the overall probability is . Based on some initial simulations, you expect a standard deviation between $25,000 and $45,000 for the ending account balance. You will consider both of these values in the sample size analysis. As mentioned in the section Overview of Power Concepts, an analysis of confidence interval precision is analogous to a traditional power analysis, with "CI Half-Width" taking the place of effect size and "Prob(Width)" taking the place of power. In this example, the target CI Half-Width is 1000, and the desired Prob(Width) is 0.95. The NTOTAL=. option identifies sample size as the parameter to compute. The ALPHA=0.1 option specifies a confidence level of = 0.9. The HALFWIDTH= option specifies the target half-width, and the STDDEV= option specifies the conjectured standard deviation values. The PROBWIDTH= option specifies the desired probability of achieving the target precision. The default value PROBTYPE=CONDITIONAL specifies that this probability is conditional on the true mean being captured by the interval. The default of SIDES=2 indicates a two-sided interval. Output 68.7.1 shows the output, and Output 68.7.2 shows the plot. 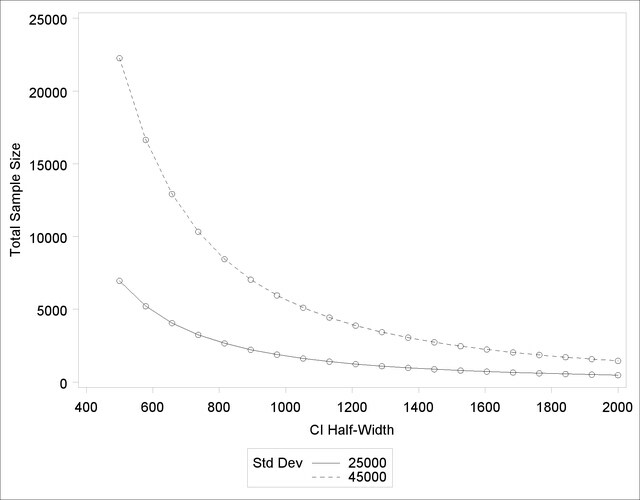 The number of simulations required in order to have a 95% chance of obtaining a half-width of at most 1000 is between 1788 and 5652, depending on the standard deviation. The plot reveals that more than 20,000 simulations would be required for a half-width of 500, assuming the higher standard deviation.